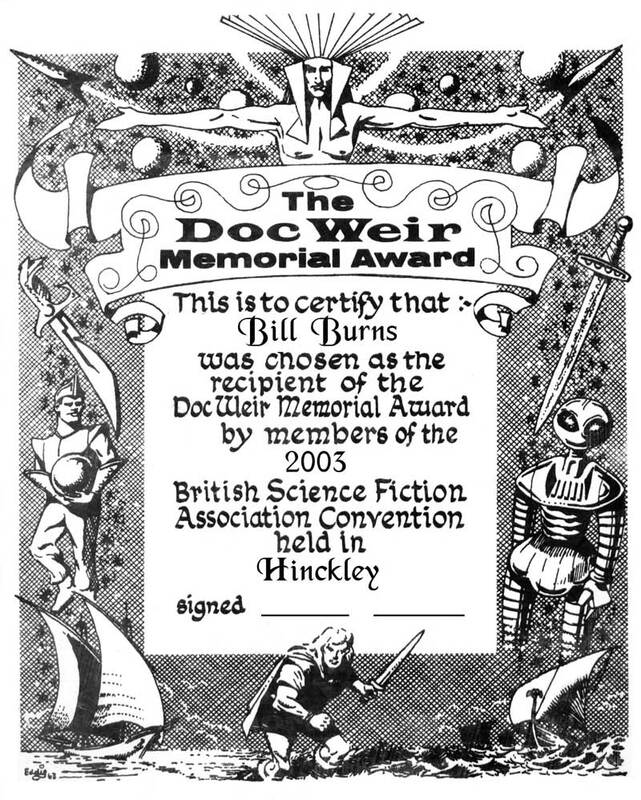 The Doc Weir Award, now over fifty years old, is presented at the British National Convention (“Eastercon”) and is voted on by the attending membership. There is no campaigning for the award, and the winner generally has no idea that he or she is up for consideration. 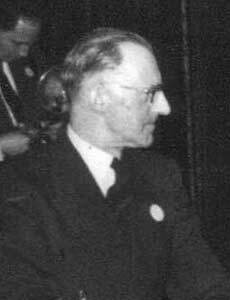 The Doc Weir Award was set up in 1963 in memory of fan Arthur Rose (Doc) Weir, who had died two years previously. Weir was a relative newcomer to fandom, he discovered it late in life - but in the short time of his involvement he was active in a number of fannish areas. In recognition of this, the Award is sometimes seen as the “Good Guy” Award; something for “The Unsung Heroes”. Fandom needs volunteers. Conventions, clubs, fanzines - they all require an extensive workforce, people who do “stuff” for no financial reward. Some people have a high-profile role but there are many who don’t, whose involvement goes almost unnoticed and may even be taken for granted. In some respects, the ideal Doc Weir Award candidate is the sort of person who doesnt immediately spring to mind but makes perfect sense if somebody else suggests them. Vote for somebody who you believe has made some form of contribution to fandom that deserves a little public recognition. The winner receives a certificate designed by Eddie Jones, and a silver cup, which they get to keep for a year. They get their name engraved on it (although, with typical fannish efficiency, the winner has to arrange to get this done). Note that space on the cup itself ran out some time ago, and more recent names are engraved on silver plates mounted on the cup’s storage box. each winner keeps for a year. Ron Bennett’s obituary of Doc Weir in the March 1961 issue of Skyrack gives more information on his contributions to fandom. The first winner, Peter Mabey, is still attending conventions when he can. first in 1965; ½r Cruttenden is close behind at 53. 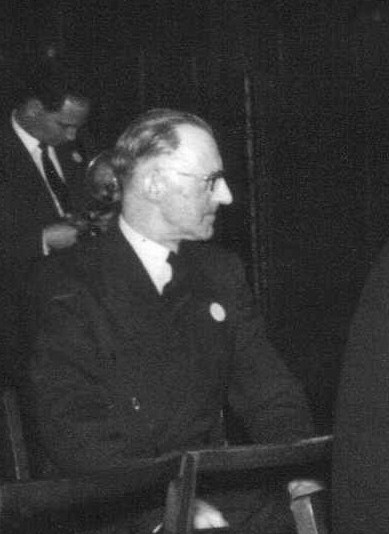 Arthur Rose “Doc” Weir at Brumcon 1959. Photograph from the Ina Shorrock collection, photographer Eddie Jones. The figure in the background is Peter West. The award has always been administered in true fannish fashion: that is, without any specific organization, each winner taking the responsibility for getting the award to the next year’s recipient. In 1967, Archie Mercer, the award’s recipient in 1964, circulated the memo below to past winners and other interested parties in an attempt to formalize the administration. It’s interesting to note that in the early days the winners did not have to arrange their own engraving! Thanks to Greg Pickersgill for supplying the text of the memo, which is reproduced here for its historical interest and for the details of the early days of the award. THE DOC WEIR AWARD originally came into being in the following fashion. When Doc Weir died, there was a project to raise sufficient money to buy his SF library from his widow at a fair valuation, on behalf of the B.S.F.A. For various reasons this project fell through, leaving the money that had been collected high and dry. The position was resolved by a general vote taken at the 1962 (Harrogate) Convention, which decided in favour of setting up the annual Award, to be given to the person whom, more or less, “the voters thought most deserving of it”. I was at the time in possession of the money concerned, a hangover from my former position of B.S.F.A. Treasurer. Accordingly I paid it over to Jill Adams, who then held that office, and Jill used it to buy the goblet and plinth which form the actual Award. The Award was first presented the following year, 1963. Since that time, the administration of the Award has been handled by a sort of ad-hoc arrangement between the B.S.F.A. Committee and the appropriate Convention Committee, and (E&OE) all expenses have been borne by the funds of one or the other of those bodies. Jill Adams and Phil Rogers have at various times arranged for the engraving of the winners’ names to be kept up to date. On two of the five occasions (1964 - when I myself won it - and 1967) I have handled the bulk of the paperwork arrangements, and in other years have helped to ensure that the Con Committee of the year got the details right and stuck to the generally-agreed formulae all along the line. So far, this system has worked. It is, nevertheless, basically something of a hit-or-miss arrangement, and there is in fact nothing (so far as I’m aware) to ensure (a) that the Award is in fact awarded each year, and (b) that the traditions concerning such matters as voter-eligibility, ballot-secrecy etc., are maintained. At the 1967 Convention I made a few tentative enquiries as to the Award’s actual status. At the B.S.F.A. Annual General Meeting, Ken Slater (B.S.F.A. Vice Chairman and. at the time the Award’s incumbent holder) ruled that the Award was not a B.S.F.A. responsibility. If this is so, then possibly it’s a Convention responsibility. But this has not been definitely established, either. Voting rights are by policy confined to Convention members, therefore voting forms are for convenience distributed with Con-literature, and the Award is presented at the Con: on the other hand, the winner’s Certificate is signed by the senior B.S.F.A. officer or officers available, in his or their B.S.F.A. capacities, and the Award itself is (as mentioned above) a substitute for a once-hoped-for increment to the B.S.F.A. library. Thus the question of precisely who has the power to decide on any changes of policy, new precedents etc., is therefore obscure. Likewise with the question of precisely who will do the paperwork etc. each year. Usually, as I’ve said, I seem to have something to do with the latter matter; nevertheless the possibility exists that some year or other things might simply go by default. It has been suggested (thank you, Ken Bulmer) that following the T.A.F.F system, the latest holder should administer the passing of the Award to his or her successor, and that present and past holders as a body should take full responsibility for any questions of policy etc. that may arise. Regarding the first suggestion; some possible holders, obviously, will be more administration-minded than others. The current holder is known to be adequately administration-minded, but is also known to have more than enough on her administrative plate as it is. Regarding the second suggestion; this seems to me to be an excellent idea. Reversing the order of the points, I would therefore like to make two proposals; or perhaps it’s rather a case of one proposal and one offer. PROPOSED- that the past and present holders of the Doc Weir Award accept collective responsibility for the future administration of the Award, accountable to nobody else whatsoever. Your comments are requested. If the winners are favourable to the idea, and provided that none of the other interested parties has any objections, I intend to go ahead as outlined above. Over to you lot, please!